The most recent mass layoff figures are similar to the second quarter 2008 figures when there were 1,756 mass layoff events. 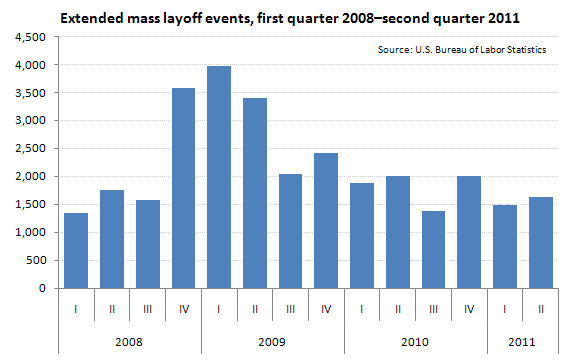 The downward trend might suggest that mass layoff events are returning to their pre-recession levels. The graph below portrays a historical timeline of extended mass layoff events that took place from Q1 2008 through Q2 2011. The first quarter of 2009 experienced a total of 3,395 extended mass layoff events – the most devastating layoff period for private non-farm sectors in the last four years. Since the layoff pinnacle in 2009, the numbers have been slowly trending downward with bumpy spikes along the way. The data also revealed that the total extended mass layoff events have decreased over-the-year from 2,008 to 1,624. There have been seven consecutive quarters of over-the-year decreases in the number of extended mass layoff events. Additionally, the number of extended mass layoff events also declined in 16 of the 18 major private non-farm industry sectors over-the-year. The third quarter of 2011 should bring increasingly positive results.